If you're anything like me (and you're probably not), I find myself constantly barking into my phone for the intellectual assistant on the other end to take a memo. The problem with this method is I don't always go back to check the messages I leave nor am I all that confident Siri understands me. Many times, the dictation is lost in translation. Days, weeks, even sometimes months later when I do bother to go in and check, I'm very often left scrunching my face trying to figure out why I jotted it down in the first place. You see, I'm a notorious note taker by nature, pen and paper being my weapon of choice. I scribble down notes on just about everything - bank statements, birthday invitations, kids homework, but I do appreciate the notes app, especially if I'm out and about or there isn't a piece of paper or a working pen to be had. If I don't, it will go unforgotten and never thought of again. However, if you asked me what my best friend in third grade's phone number was or what my middle school crush ate for lunch on April 16, 1993, I could recite it like the Pledge of Allegiance. The other day, a notification popped up on my phone letting me know that my storage was almost full. Usually when this happens, my photos are the first thing to go to create space - until a friend of mine told me to delete old texts and notes before anything as they can collectively take up more storage than photos. I'm not confident this information is correct, but it's certainly a better solution than deleting photos I'm not ready to part with. I scrolled back to the beginning of the virtual thought pile and the discovered I had a total of 247 thoughts, ideas, and random stupidity backed up into that small device. I even had a few of those hiding from 2013. So I thought I'd share with you some of the crap I ask Siri to dictate or information I feel the need to plug into my phone for later, uh, reference? I sure am, but I'm not sure this was necessary to put into notes. Venti, half non-fat, half-soy, Americano extra hot with two shots of mocha, shot of espresso, shot of decaf with four Splenda and three Equal. I laughed when I saw this because I distinctly remember this moment. My husband took me to Chicago to eat our faces off for our ten year wedding anniversary. This was an actual order from someone in line in front of us at a very popular coffee house establishment. She had to tell the barista four times what she wanted. The third time, I pulled out my phone to write it down so I could later digest how ridiculous some people really are. It's just as funny today as it was then. Byron.....Byron. Who the hell is Byron? Did I need it? Did someone want to borrow it? More importantly, why did I need to "get on it"? One of these days, I will have the opportunity to sleep with my freaking bedroom window open and sleep past 5:30am uninterrupted. F*@!ing stupid dog! Clearly I needed to vent to someone and Siri did the job. My old neighbour had a incredibly annoying yappy dog. Honestly friends, I love dogs, but this dog barked at anything and everything that moved. The husband, who was about as charming as a bear with a thorn in his paw, thought it was completely acceptable to let the dog yap incessantly at 5:30am EVERY MORNING for at least 25 minutes. Other neighbours were annoyed as well because we heard the odd yelling to shut the dog up. They moved a year later and thankfully, the damn dog went with them. My husband and I actually did a happy dance around the living room when we saw the real estate agent plunge the sale sign into the ground. And I now sleep past 5:30am. I hope it is or was okay because guess what, folks? I NEVER CHECKED IT. You were super shy and had a thick Norwegian accent. Your friends had "Motiva Beaucoup is Mega Beaucoup" stickers all over their barbecue grill when I stopped by your garage sale on my way to pick up a 1900s frame from a seller on kijiji. They were grilling hot dogs and whole onions - as in whole onions. They were all very nice, especially Jessica from Walla Wallaby, Australia. I was totally fangirling when they said you were in the house. After a moment, you came out of the house, but had no face. I hugged you really hard and told you how much I loved Star Wars. We talked for like seconds, but then Dream Motiva turned into someone else and I wasn't talking to you anymore, but about you. I bought doughnut-flavoured potato chips from your friend because the packaging was so pretty. It was turquoise with fuchsia pink polka dots and mini doughnuts all over the bag. I was somehow transported upstairs in the dream because when I left, I was walking down rickety wooden stairs on the side of the house back to my car, thinking,"Wow. I only paid 92 cents for these snacks!" Then I awoke to my cat sitting on my face. This made me laugh really hard. I often have weird dreams. Very weird dreams. Many times, I have a notebook by my bed to write them down. It's something I've done for years. This particular dream, I dreamed of Motiva Beaucoup. If you don't know Motiva, I suggest you do. She's a blogger from Halifax, Nova Scotia and she's absolutely hilarious. I felt compelled to message her and tell her about it. She replied and now we're dating. BASIC. BASIC like Anne Hathaway. DYING. Is Anne Hathaway basic? While I would give anything to figure out why I felt the need to write this, can we discuss how excited I am for this new phrase of the week? This could be some of my best work yet. At what point do you call someone out for constantly interrupting a conversation? And at what point is it okay to punch them in the face? This, friends, is just a small glimpse into my weird, little brain. However, if it wasn't for thought processes like this, then these Oatmeal Cookie Pancakes might not have been christened. 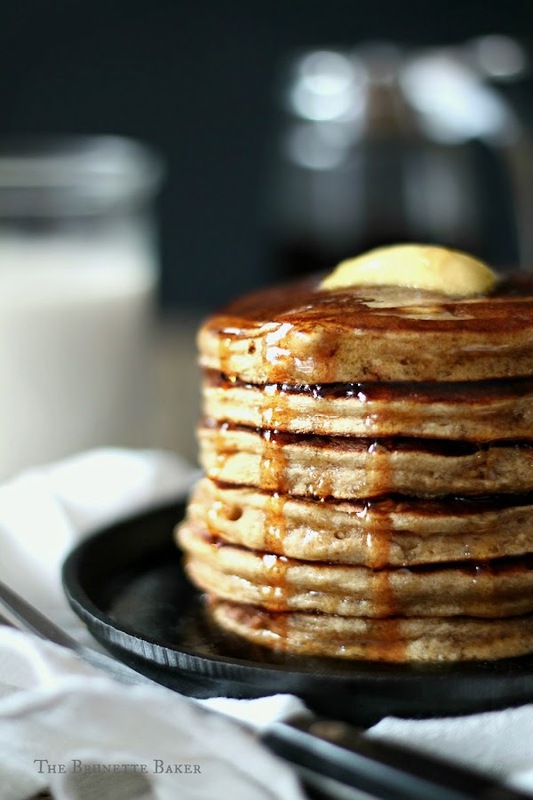 A fluffy, diner-style pancake with the flavour essence of an oatmeal cookie. These have become a family favourite of ours and I'm sure you'll agree. Hmm. We're almost out of maple syrup. Must buy some more. In a large mixing bowl, whisk together flour, rolled oats, cinnamon, brown sugar, baking powder, baking soda and salt until all ingredients are well incorporated. Set aside. In a separate mixing bowl, whisk together egg, buttermilk, melted butter, and vanilla extract. Pour dry ingredients into wet ingredients and mix just until combined. *In a clean mixing bowl, beat egg whites with an electric mixer on medium-high speed until stiff peaks form. (I use the same mixing bowl that housed the dry ingredients. Just wipe out any leftover bits with a clean, dry tea towel). Gently fold egg whites into pancake batter. Do not overmix. Pancake batter will be quite light and airy. This method will give you a fluffy, diner-style pancake. If you choose not to use this method or prefer flatter pancakes, simply omit egg whites and use one whole, large egg. Heat a frying pan over medium-high heat and lightly coat surface with butter or canola oil. You can omit the fat altogether if using a non-stick pan, just make sure the pan is quite hot initially, then slowly reduce to moderate heat. Using a ¼ measuring cup, scoop out batter and apply to prepared pan. Pancakes are ready to flip when the surface and outer edges begin to bubble. Serve with warmed maple syrup. For an added treat, add raisins to maple syrup if you so desire. Let's be clear: we're dating because you're fluent in English. This post made me laugh!! It's funny because it's true. I have some of the most bizarre notes on my phone! "Chicken gizzards and how to prepare"! Jenny, I don't even eat chicken because I'm vegetarian!!! LOL! This post is hilarious, and the pancakes look amazing! 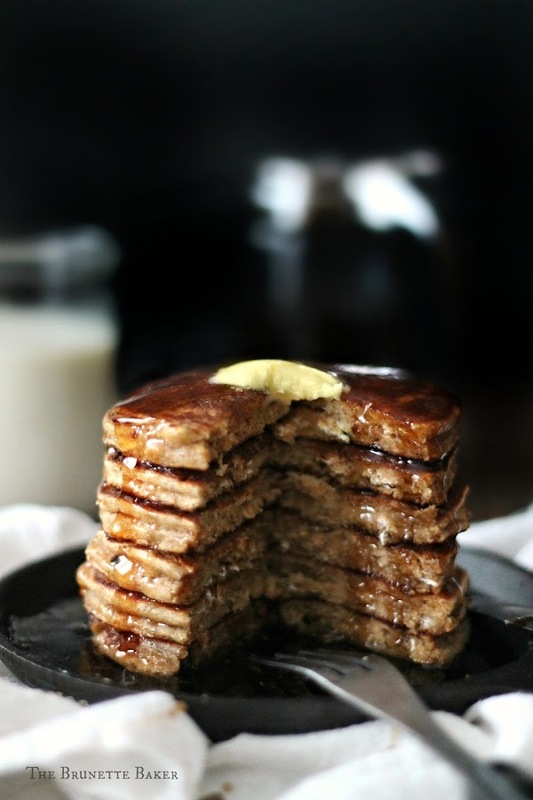 I am a HUGE fan of oatmeal cookies, I literally eat them by the fistful, so this pancake recipe will be made PRONTO. Thanks for sharing! This post is everything! Your posts always make me laugh, but this one was so right on that I almost missed these gorgeous pancakes you made!! I'm a big list taker too except I always throw them away by accident! LMFAO!!! This was the funniest thing I've read in awhile! I din't have as many notes as you do, but I have some odd ones myself. I had one in there I forgot about of what a friend said when she was a bit tipsy. Did ti ever make me laugh!!! Thanks for this and for these delicious looking pancakes! I think I may treat myself to these this weekend!! ahahaaaaaa I love the notes! They're so funny! 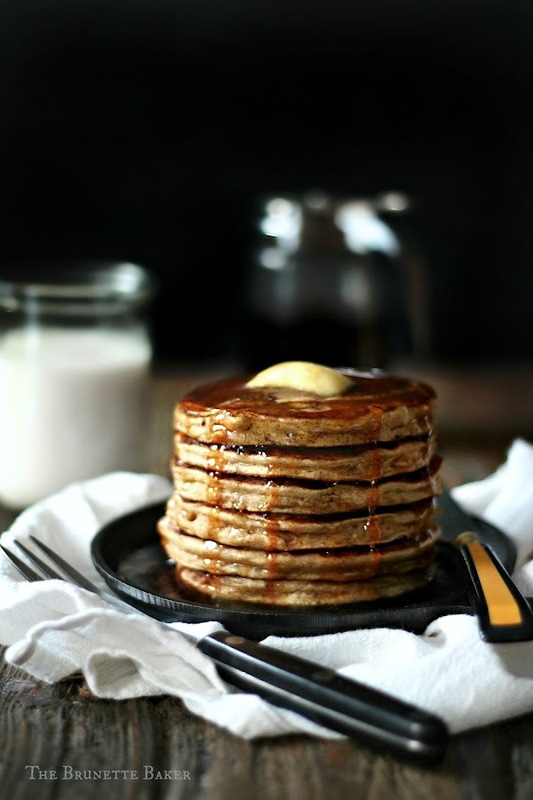 And these pancakes look uber fluffy and so chewy and sweet and delish!